Law enforcement is a career choice with many rewards. 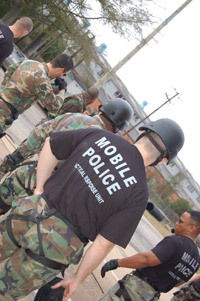 As a metropolitan police force of nearly 500 officers, the Mobile Police Department offers a wide range of work experience from traditional patrol work to highly specialized assignments. It's a stable job with good pay and outstanding benefits, such as comprehensive health coverage, 50 percent tuition reimbursement, family medical leave and take home cars. All equipment is supplied by the department to our officers. On the job, patrol officers work 12-hour shifts. By working two rather than three shifts in a 24-hour day, officers end up working a total of seven out of 14 days and are scheduled a three-day weekend every two weeks. It's a family-friendly work schedule. Once out of patrol, officers can specialize in a wide variety of assignments. Some of those include the Tactical Response Unit, Youth Services, Narcotics and Vice, the Canine Unit, Motorcycle and Mounted patrols, Intelligence, Internal Affairs and Community Policing. Our Homeland Security Unit takes a lead role in securing the land and water borders of our community. The level of training at the Mobile Police Department is high to assure that our officers can meet the demands of the job. Recruits receive 600 to 700 hours of academic instruction compared to the state requirement of 480. Course work covers the gamut of law enforcement work: civil and criminal law, traffic law, physical training, driving instruction, weapons training, combat training, defensive tactics and much more. A full 80 hours is devoted to the handling of difficult situations such as domestic violence with weapons, felony traffic stops, and difficult pursuits. The Department utilizes cutting-edge technology and equipment, giving our officers the advantage in intelligence gathering and combat situations. Departmentwide computer analysis of crime trends and hot spots provides key data for tactical planning and deployment of resources. The Mobile Police Department has met the stringent requirements of accreditation by the Commission on Accreditation for Law Enforcement Agencies, Inc.